This was first posted on April 10, 2009. In the Christian tradition, today is Good Friday. The day commemorates the crucifixion and death of Jesus. In churches around the world today accounts of Jesus' death will be read with great solemnity and prayers will be offered. Jesus was crucified, a brutal and terrifying method of execution which was fairly common in the Roman Empire at the time. 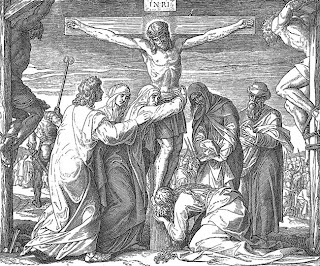 Human beings were nailed to large wooden crosses and publicly suffered and eventually died. Over the centuries artists have struggled with how to depict this horrific event. Some have chosen a bloody realism. Others have used a softer filter. The crucifixion, however, is a very common subject in Christian art, but it did not become so until after crucifixion was outlawed in the empire in the 4th century AD. Before that, people had seen crucifixions first-hand. They did not need to see artistic representations of something that was fairly commonplace. Over time the cross, the symbol of the crucifixion, has come to be the most common symbol in Christian art. 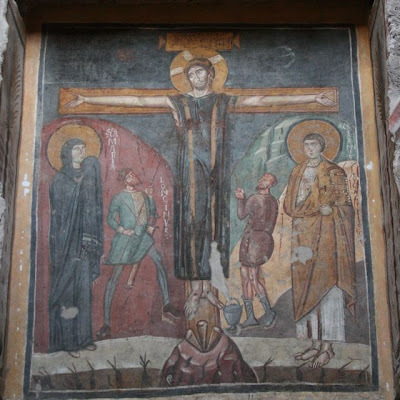 One of Rome's oldest surviving depictions of the Crucifixion comes from Santa Maria Antiqua, a very old Christian church found in the Roman Forum. 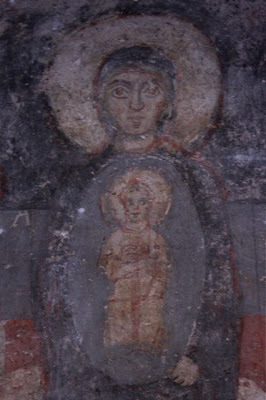 Santa Maria Antiqua was consecrated as a church in the 6th century AD and the frescoes on the walls date from the 6th to the 9th centuries. The church was partially destroyed by an earthquake in 847 AD, and eventually it was buried only to be discovered again after another earthquake in 1900 and subsequent archaeological excavations. It is closed to the public, but I often take groups of travelers there for private viewings. Michelangelo traveled to Carrara to choose a large piece of high-quality marble for the work. The contract called for a sculpture of Mary holding the crucified Jesus. The composition Michelangelo created involved carving two full-sized figures from one block of marble—a difficult task. Michelangelo bent the rules of proportion to his own purposes: Mary is much larger than Jesus to support the weight of a life-sized figure in her lap, but their heads are the same size, making the difference in size hard to detect. Mary’s size serves a structural purpose, but it also allows the grieving mother to hold her son on her lap, creating a tableau that is both powerful and tender. The Rome Pietà—as it is now known—was installed in St. Peter’s and was immediately acclaimed as a work of supreme beauty and skill. But as he stood in the basilica one day, Michelangelo overheard someone attribute the piece to Gobbo, a sculptor from Milan. Michelangelo grabbed his tools and returned to add one final touch to the piece: his signature on the sash across Mary’s chest. It was the only piece he ever signed. Today the Rome Pietà occupies a side chapel in St. Peter’s Basilica, separated from viewers by thick panes of bulletproof glass installed after a vandal attacked the piece with a hammer in 1972. Before St. Peter’s was rebuilt, the sculpture sat on the floor and above a tomb. Today it is displayed on a pedestal in a secluded chapel, which prevents it from being seen at its best angle. Some experts believe that if it were moved to a dark church, the lighting would shift the focus away from Mary and on to Christ. Michelangelo’s Rome Pietà was recognized as extraordinary for its emotional depth, as well as for its technical mastery, and the artist’s reputation rapidly grew. He had achieved his goal: in his five years in Rome, he had established himself as a sculptor in demand. Michelangelo was only 24 years old when he carved the Rome Pietà, but during his life he turned again and again to the image of Mary holding her dead son in her lap. He lived through wars and the plague, political intrigue and unsanitary living conditions, and Michelangelo knew death and grief. He outlived his entire family as well as many of his friends. He seems to have poured his own grief into his work. 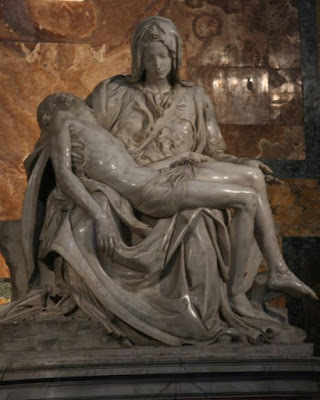 Of the two pietàs that he worked on as an adult, my favorite is the Florentine Pietà. 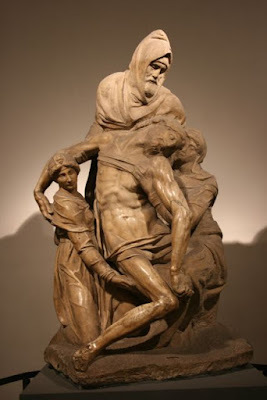 Now housed in the Museo dell'Opera del Duomo in Florence, the Florentine Pietà represents Michelangelo's older years. He began work on it following the death of his dear friend, Vittoria Colonna. She died in 1545, when Michelangelo was seventy years old. as the Florentine Pietà, a piece that he intended to be placed on his own tomb. The project, eventually abandoned by Michelangelo, depicts Nicodemus, Mary, and Mary Magdalene supporting the dead body of Jesus. Nicodemus’s face is a self-portrait. I was revisiting your book last night & re-read the part about the Florentine Pieta. Such a wonderful book - can't wait for the Michelangelo's Florence to come out. Thanks again for your great blogs.